Most, if not all, smart city discussions revolve around the pervasive and expanding Internet of Things (IoT). In attempts to reach “smart city” status, governments have taken steps to keep pace with the digital world and associated citizen expectations. Initial projects by smart city pioneers began to break down technology barriers, incorporate smart devices and sensors, and make information discoverable and accessible for meaningful insight. These projects generated excitement, created headlines, and established outcomes that supported early investment. But most were limited in scope and have not advanced much beyond a proof-of concept stage. At this stage of smart city evolution, the question becomes: what’s next? We can’t be truly smart if our solutions don’t move beyond flashy apps that are only surface deep. To that end, the definition of a smart city cannot be limited to IoT. In practice, smart cities are those that upgrade platforms to seamlessly exchange data. Smart cities leverage modern systems to sustainably innovate beyond IoT. Beyond that, to be really smart is to aspire to become a connected community – the next-level result of smart city evolution. To achieve genuine connectivity, continue to move the needle, and keep pace with private innovation, local governments need something most of them lack: a modern, cohesive, foundational digital infrastructure. Smart city growth – have we plateaued? 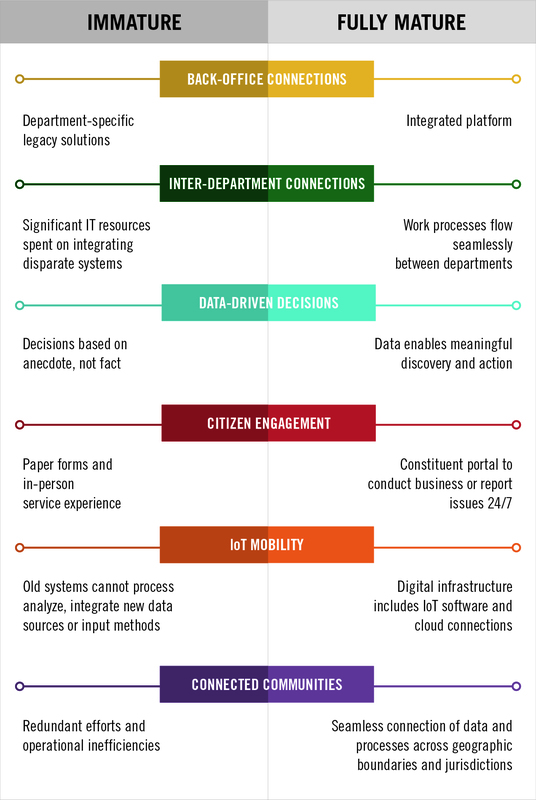 According to Gartner’s September 2017 report for CIOs, “Only a few local governments have achieved an integrated platform approach.” The Center for Digital Governments 2016 Annual Survey showed that 73 percent of counties identify integration and modernization as their greatest staffing needs in the coming years. We know integration is critical, (chances are, elected leaders and the public believe it has already occurred), but we can’t seem to get there. The stagnation is caused, in large part, by legacy back-office systems that have been in place for decades and require lengthy approval, procurement and implementation processes to replace. And these processes tend to happen independently. Directors evaluate new systems solely on functionality for their respective departments, without considering interoperability with other systems. Typical local governments can have a dozen or more back-end, or line-of-business, systems installed; built on different platforms or provided by different vendors at various stages of maturity. This traps processes and information in individual silos. Not only do few, if any, professional staff members have self-service access to real-time data from all relevant systems, the age of the systems themselves can be problematic. Many cities are now facing the reality that older systems are not capable of processing, analyzing, or integrating new data sources. 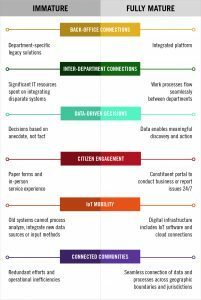 The smart way to build a lasting smart city begins with solid technology layers and attention to the core, back-office business systems. Investing in a strong digital foundation not only helps overcome these challenges, but truly transforms government for the digital era and enables it to thrive with future innovations. Achieving meaningful data sharing that facilitates smart city evolution is not difficult in practice, but technical and cultural hurdles persist. These include older technology, vendor inflexibility, and internal resistance to sharing information. Link together or automate business processes across jurisdictions. Many cities have recognized the power of a strong digital infrastructure and are solving problems and creating opportunity as they mature. Mobile, Ala., for example, is a pioneer in upending the old technology procurement model by looking at all systems together in a long-term vision of connectivity. By 2017, Mobile had moved all of its departments to the cloud by working with a single software vendor that supported comprehensive integration and provided cloud-based modules for all city functions. By simply linking police and court records, police department paperwork shrank by 98 percent and the city saved over $500,000 annually. Plant City, Fla., used integrated ERP and financial systems to expedite maximum FEMA reimbursement for damages sustained by Hurricane Irma. Lake County, Ill., opened up its back-end software to its municipalities, streamlining everyone’s work through a shared system and replacing manual routing of inspections paperwork between the municipalities and county with a direct flow of information from request to inspector. Fulton County, Ga., authorities can now look at crime rates across various neighborhoods, see where individual crimes were committed, note when someone is apprehended and determine where the offender resides. To connect these dots, county officials integrated the flow of information between law enforcement, judicial and property tax systems. Connecting data and processes plays a crucial role in meaningfully addressing issues that affect us all. Citizens affected by the opioid crisis, homelessness, traffic, health care and more, are waiting for our fixes. Solutions lie in breaking down silos and revolutionizing data sharing to better collaborate, gain insight, increase productivity, and provide information to potential partners. 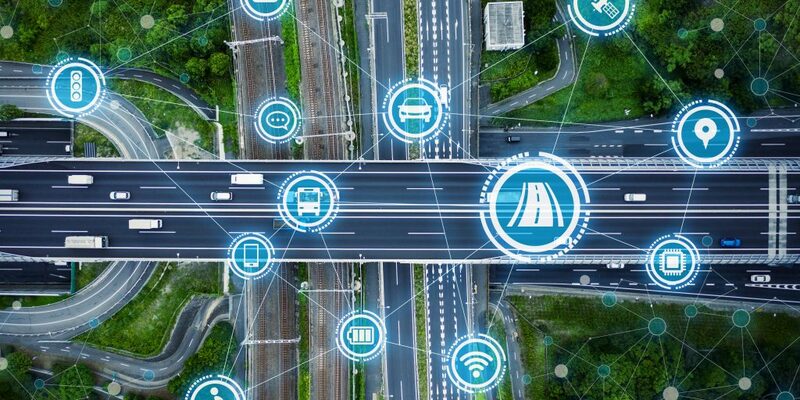 While Smart City initiatives improve efficiencies within one jurisdiction, even greater potential lies in connecting data and processes across jurisdictions. These connections make communities safer, smarter, and more responsive to the needs of residents. In this way, smart cities are a part of connected communities. When city, county, and regional government services are connected within a healthy digital infrastructure, core line-of-business systems seamlessly integrate, while preserving each jurisdiction’s autonomy and control in a highly secure environment. Community leaders make better decisions with automated information flow and consolidated data. Critical processes that involve multiple jurisdictions seamlessly move forward along the necessary progression of events. Citizens engage with government on issues and conduct civic business through a single constituent portal in real time. This vision relies not only on the foundational digital infrastructure, but on the leaders who are best positioned to drive decisions that change both culture and procurement. A commitment to and strong, clear articulation of an integration approach is vital to transform governments and the communities they serve for the better. Attending to a government’s core digital infrastructure will ensure immediate returns on investment as well as the flexibility necessary to grow and adapt, again and again – in governments, and across regions. Bruce Graham is the chief strategy officer at Tyler Technologies. Bruce joined Tyler in 2008 as president of the Courts & Justice Division.